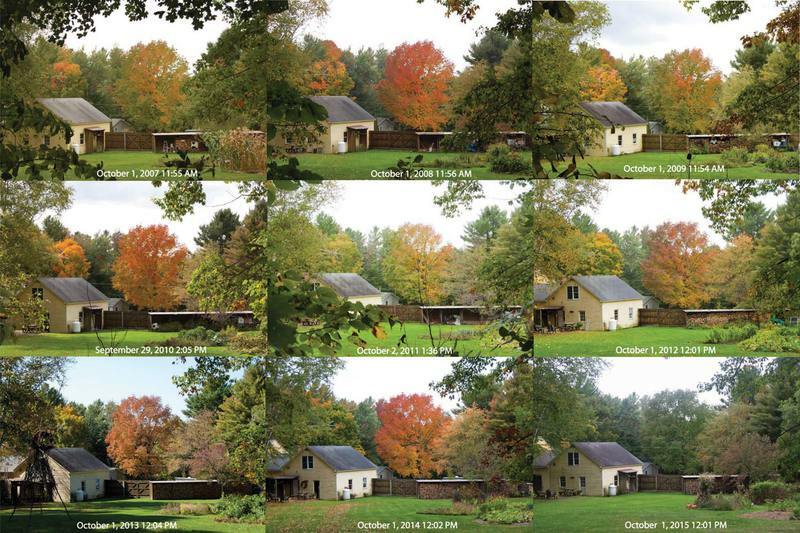 Salisbury Vermont (LEAFFEST HQ) -- After nearly a decade of study, scientists in Vermont have discovered how to subdue the traditional colorful displays of fall foliage. Experts predict that this will prevent tons of carbon dioxide, a greenhouse gas, from being released in the state during October by slow moving cars from Connecticut and New Jersey. Author and activist Bill McKibben of Middlebury College confirmed the broad implications of this breakthrough: "Vermont is a green state. There are going to be palm trees growing here soon anyway, so it's time we become accustomed to this color year round." The best way to learn whether fall will ever arrive in Vermont this year is to attend LEAFFEST. Other scientists with actual credentials say that good fall color depends on dry and cool weather this time of year. We have not had any chilly temperatures yet, and hurricane Joaquin promises to make things warm and wet early next week. But the next two nights will drop into the 30s for the first time. LEAFFEST is still a week away, so the chlorophyll has plenty of time to fade away. I think the timing might be just perfect. LEAFFEST is happening Friday evening through Sunday October 9-11. Public Lab will be supporting us again this year so the event is free to all, and food will be provided. There is plenty of lawn for tent camping and a few spots on the floor inside. If the weather holds, there might even be a few tomatoes hanging on in the garden. Plus I have been canning, pickling, and freezing for a month, so the garden will feed us regardless. This is where it will be in Salisbury, VT. The agenda will depend on who attends, but we are expecting demonstrations and brainstorms related to the Oil Testing Kit, the Riffle, NDVI calibration, and whatever YOU bring. I will post some updates to the Public Lab Northeast Google group as we learn more about the plan. Please sign up with the form below so we can begin planning. There is also a Google sheet for ridesharing. See you soon in Vermont!